To view images from our last meeting click here. If you missed the opening reception for Building by the Book: Book Artists Respond to Architecture & Design on March 5, we welcome you to join us for Philadelphia Center for the Book's next Members & Friends Meeting to hear some of the artists talk about their work and view the exhibit. For additional information on the Exhibition and Reception contact the Print and Picture Collection between the hours of 9-5, Monday through Friday, at 215-686-5405 or the Art Department during evening and Saturday hours at 215-686-5403. First-year students in the MFA Book Arts/Printmaking Program at the University of the Arts present a varied exhibition of works in progress, including book arts, printmaking, works on paper, photography, video and installation. Artists include Turner Hilliker, Daniel Corrigan, Laura Beyer, Becky Davies, Jody Arthur, Yuka Petz, Sean Dyroff and Jamie Schilling. Opening reception: March 19, 5:30 – 8:30 p.m. Beyond the traditional use as a two-dimensional surface-this is a call for paper as art. Manipulated, cut, pasted, altered, formed, poured, folded, or otherwise used in unique creation. 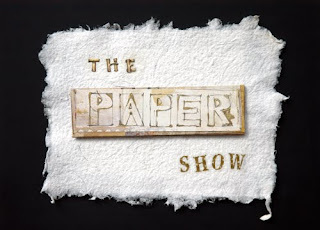 Paper must be central to the theme or material of the artwork for consideration in the show. This is an juried exhibition open to all artists. Each artist can submit up to three pieces with a $10 entry fee per artist for accepted work only. Only one of the three submitted works may be chosen for the show depending on space. 1. You will receive a confirmation email with further instructions reminding you when to bring your work.